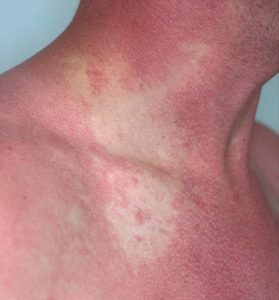 Niacin is mostly used in a medical capacity to treat Vitamin B3 deficiency and the problems it creates; namely pellagra. However, high amounts of niacin can also be used to treat primary hyperlipidemia and cardiovascular disease. Niacin isn’t some kind of cure-all, though. There are limitations to the medicine and it comes with side effects. The most common effect niacin causes are flushing. This is when the dermal blood vessels are left heated and red due to vasodilation. It also causes a burning and tingling sensation. This flushing will usually go away within 30 minutes, and it is suffered by around 70% of the people who take niacin. Flushing is also sometimes followed by itching and skin rashes. One of the most important aspects of flushing is prostaglandin D2 (PGD2). These prostaglandins are created by the cells found in bone marrow – particularly platelets and Langerhans (dendritic) cells, leading to the creation of lipids that depend on the cyclooxygenase-2 enzyme (COX-2) by dermal or epidermal cells. It’s possible to reduce the effect of this flushing by taking aspirin before taking niacin. Even though taking a small dose of aspirin, such as 81mg/day can suppress the release of PGD2 by niacin the symptoms of flushing are still present when taking higher amounts of the drug, such as 325 and 650 mg. As such it is known for sure if prostaglandins can suppress flushing or not. PGD2-mediated niacin flushing is typically caused by the D-Prostanoid (DP)1 receptor. Experiments have been performed on both mice and humans to show that antagonizing DP1 reduces vasodilation caused by niacin. There is a DP1 antagonist called laropiprant (LRPT) reduces niacin-induced flushing without affecting lipid levels. This combination is known as Cordaptive in the USA and Tredaptive in Europe. There are other side-effects associated with niacin. It’s also been shown to reduce insulin sensitivity. One way to potentially offset this effect is to increase the amount of fatty free acids after niacin has suppressed them. The Coronary Drug Project showed that the cardiovascular benefits of niacin were the same for people who do or don’t suffer from reduced glucose tolerance. Niacin can also cause something that is akin to gastritis as it induces heartburn, nausea, vomiting, indigestion, hiccups and stomach pain, but it’s not known why this happens. Niacin can also cause a hepatoxicity due to the metabolites of niacin which present as an increase in serum concentration of liver transaminases. There are more serious side effects including jaundice and fulminant liver failure. Niacin is also known to possibly increase plasma uric acid levels and induce gout, which is one of the more common forms of inflammatory arthritis. The reason for this could be that niacin inhibits uricase (a copper-containing enzyme that oxidizes uric acid), or it could be because the amount of uric acid excretion is reduced. It’s also possible that niacin causes negative reactions with other medications. Niacin can improve the effectiveness of blood pressure drugs which can lead to hypertension (high blood pressure). Taking niacin with anticoagulants can also increase the chance of bleeding. Also, niacin shouldn’t be taken with antibiotic tetracycline because it can interfere with it being absorbed which reduces its effectiveness. Many of the adverse reactions to niacin are believed to occur with doses of between 2000 and 6000mg of elemental nicotinic acid per day in both unmodified and extended release forms. Therefore it’s important that you don’t self-administer niacin as a dietary supplement and instead take it under the guidance and instruction of a qualified physician.